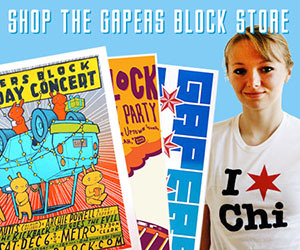 Activists sat outside of a construction site on University of Chicago's campus on May 19 to protest the continued calls for Chicago to get the presidential library for Barack Obama when the South Side was lacking something that seemed very essential: a trauma center. Trauma centers are specially designed areas of hospitals to treat patients who need treatment for trauma, which includes gunshot and stabbing wounds and car accidents. University of Chicago has a pediatric trauma center at Comer Children's Hospital as well as a burn unit, but there is no adult trauma center on the South Side. Activists protested the lack of a trauma center on the South Side by sitting in at a University of Chicago construction site on Monday. The four protesters were dragged from the site by University of Chicago police, but no one seemed to be arrested, according to the Sun-Times. "The University of Chicago upholds the right to peaceful and safe demonstrations, but cannot allow protests that jeopardize anyone's safety," University of Chicago Medicine said in a statement. According to the statement, University of Chicago works with protesters who will protest at the medical campus to find areas that are safe both for the protesters as well as for patients. Monday's protest occurred on a secured, fenced construction site, according to University of Chicago. "Despite repeatedly offering the protesters alternative locations that are safe and on public property, they chose to remain on the construction site," University of Chicago Medicine said in a statement. "As a result, we had no choice but to remove them from the location, for their safety and that of the workers at the site." According to the statement, no charges are planned for the protesters. University of Chicago is considering submitting a bid for the Barack Obama presidential library. Activists argue the university should not get the presidential library until an adult trauma center is opened on the South Side at University of Chicago. 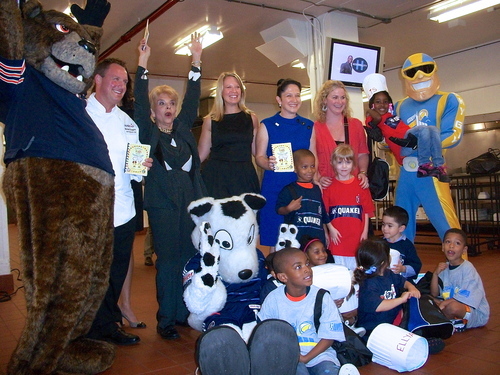 The University of Chicago operates the South Side's only burn unit as well as a pediatric trauma center at Comer Children's Hospital. Sitting between Hollywood and Edgewater on Ashland is a vacant decaying building. The building is that of Edgewater Medical Center, which has been closed since 2001. The hospital has three claims to fame: the first and second are that it is the birthplace of Hillary Rodham Clinton and John Wayne Gacy. The third claim to fame is the reason why the hospital closed. It came to light in 2001 that Edgewater Medical Center had been defrauding Medicare. Among the procedures the hospital was performing were unnecessary angioplasties, and two patients died from the unneeded procedures. Eventually, the fraud came to light and Medicare decided to stop reimbursing Edgewater Medical Center. The hospital closed in December 2001 after a string of financial problems, left in a state that seems as if everyone up and left. Twelve years later, Edgewater Medical Center still sits empty, a dangerous eyesore. During the 12 years since its closure there has been a lengthy debate over what to do with the land. 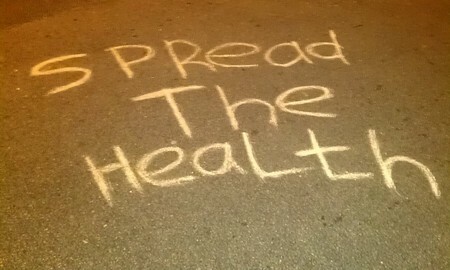 Should the site of the hospital be used for condos or for what residents feel is a much-needed green space? Roseland Community Hospital has been in the news recently because of its financial struggles. According to Crain's, Loretto Hospital in Austin is a possible purchaser of Roseland. Roseland is a safety net hospital, which means it is what the National Association of Public Hospitals and Health Systems describes as a hospital which provides "a significant level of care to low-income, uninsured, and vulnerable populations." A safety net hospital is not the same thing as a public hospital, which is operated by a government. Public hospitals can be safety net hospitals, but a safety net hospital is not a public hospital. 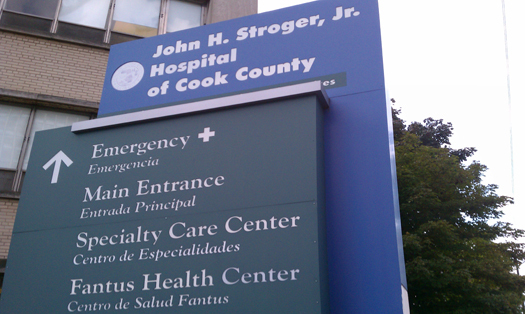 John H. Stroger Jr. Hospital of Cook County is a public hospital that is also a safety net hospital. 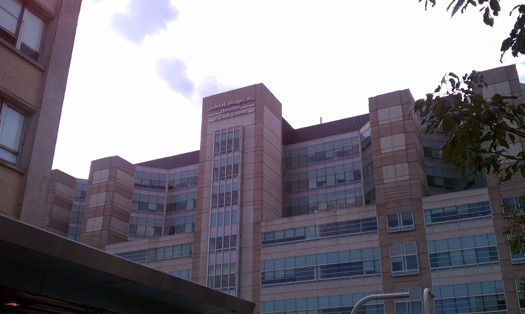 Mount Sinai Hospital is a safety net hospital, but it is not a public hospital. The unfortunate thing about the news regarding Roseland is it might be a sign of what's to come for safety net hospitals. As time progresses, safety net hospitals need to come up with solutions on how to stay afloat as they could lose patients as a result of Medicaid expansion. This is some news that ought to be bigger. It is sad and it is sobering. It also gives insight into how national stories are created or ignored, and popular opinion manipulated. A new Veterans Administration study estimates that 22 veterans are committing suicide each day. This represents an increase from previous study, when the VA was estimating 18 suicides per day among the vet population they serve. What this also means is that, this month, the number of veterans who take their own lives will eclipse all the homicides in Chicago in an entire year. What this means is that the number of veterans who take their own lives will be larger than the number of men and women killed in action in Iraq and Afghanistan over the past entire decade of war. And that, during the next decade, America will lose more lives to veteran suicide than US forces lost in the Vietnam War. When The Hospitals of Chicago Close, What's Next? On July 2, 16-year-old Jose Morales and some of his friends went into the abandoned Ravenswood Hospital, located at 1931 W. Wilson. According to the Tribune, while inside the building, Morales fell from the second floor to the ground floor. Morales died later that day at Advocate Illinois Masonic Medical Center. 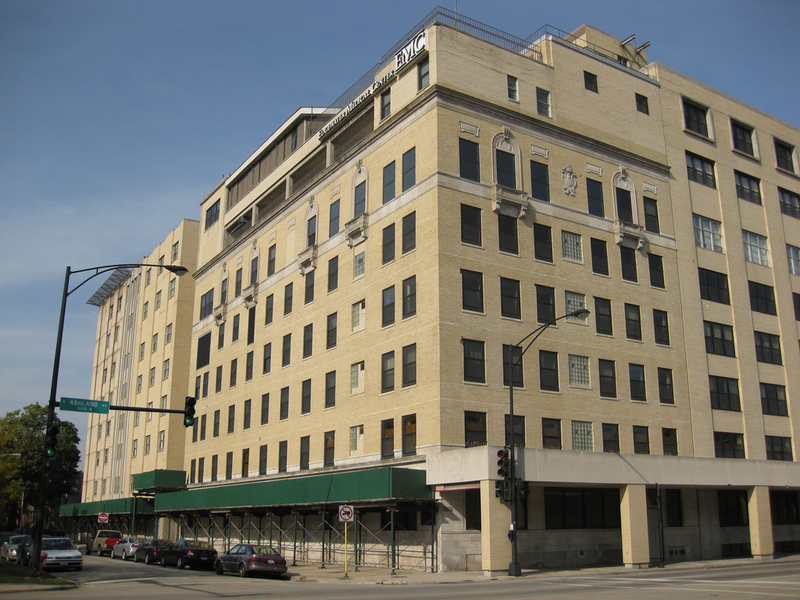 The hospital is currently owned by Lycée Français de Chicago, which has plans to demolish the hospital and build a new school building. According to the Tribune, Lycée Français has applied for a permit for demolition in the wake of Morales' death. Lycée Français would not comment on the situation with Ravenswood Hospital. Today Wheaton College became the first Evangelical organization to join Catholics in filing suit over the HHS contraception mandate. At particular issue is the mandate's requirement that institutions provide their employees with access to contraceptive drugs, such as the "morning after" or "week after" pill. While these drugs do not terminate pregnancies once the egg is implanted, Catholics and some Evangelicals argue that preventing implantation is tantamount to abortion, making these pills abortifacients. While Catholics and Evangelical positions do not completely match on all aspects of contraception (views vary widely throughout Protestant denominations), they do agree on one thing — they want to right to have a position at all. 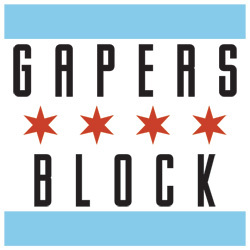 The Illinois General Assembly is considering legislation, known as SB3261, to require hospitals that receive property tax exemptions to provide more than stabilization care (already required by the federal Emergency Medical Treatment and Active Labor Act, or EMTALA) to people who earn 125% or less of the federal poverty level in rural areas, and 200% or less in urban areas. The amount of free and subsidized care provided by hospitals has been a hot button issue in Illinois, and across the country, at least since 2007, when the U.S. Senate began a series of hearings on charity care, and in Illinois since a high-profile case involving Provena health care put hospitals' tax exemptions in limbo. The legislation is an interesting approach to solving the problem of health care provisioning for low-income residents, given the immense shortfalls in Medicaid funding states have been facing since the freefall in tax revenue brought on by the Great Recession. So here's an interesting problem for students of how cities operate. Public health and public transportation are two of the marquee issues for planners, and they're intertwined. Land use planners have recently turned towards policies that encourage walkability, bikeability, and "transit-oriented development." Mayor Emanuel's administration is currently undertaking an impressive, ambitious plan to introduce more than 100 miles of protected bike lanes, of the type found on Kinzie Avenue between Jefferson and Wells. Decreasing reliance on cars is a public health issue because it makes it easier for people to be active, and decreases vehicle emissions that pedestrians encounter as they move around the city. Similarly, the Affordable Care Act had provisions for public/private community health facilities with a focus on patient outcomes rather than fee-for-service models that merely encourage remedial care. 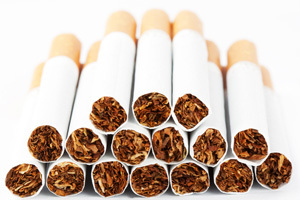 Two of the main sources of funding for public transportation and public health (particularly as the latter is undergirded by state Medicaid) are gasoline and cigarette taxes, respectively. You can see the immediate problem; the better transportation and health systems are designed, the more they must compromise the source of their funding. With transportation, this creates the most immediate problem: with increased volatility of gasoline taxes and a sharp increase in ridership, ill-equipped public transportation systems need more and more money to handle the increase (the fares are never enough to capitalize increased infrastructural capacity). A brief by the American Public Transportation Association touches on this problem; as public transportation ridership increases, capacity needs increase even while revenues drop. Because fares will never be sufficient for real expansion of capacity, there's a systemic knot that can't be untied without a federal-state-local approach to overhauling the funding system. Obviously, there's a similar problem with the vice-and-obesity taxes on things like cigarettes, alcohol, and fast and junk food. Where these revenues are meant to fund necessities--community health care in particular--the fact that the tax exists as a "disincentive" to unhealthy decision making implies the outcomes we want--healthier city living--are not really priorities. The addiction persists. Politics. A candidate for office envisions his 30-second campaign commercial. He wants five solid accomplishments he can read as bullet points. At least one, he knows, needs to be about saving the taxpayers money. To look into the camera and say, "Faced with a budget deficit, I made the tough decisions and cut X million dollars from the budget." The thirty second commercial is meant to drive a narrative. So the value of X is less important than the fact of savings. And the consequence of that X is even less so. Despite what we've come to accept, that campaign commercial is not politics--it's the ephemera of politics. Politics is what is happening at 63rd and Woodlawn, on the border between a rich neighborhood and a poor one. There, twenty Chicagoans, most of them consumers of mental health services critical to their ability to survive and function in society, have barricaded themselves in a city-run mental health clinic as a last-ditch attempt to save the facility from closure, to ensure they can keep getting the services that mean little to millions of Chicagoans but mean the world to them. Mean everything to them. Make the difference between quality of life and unbearable hardship. 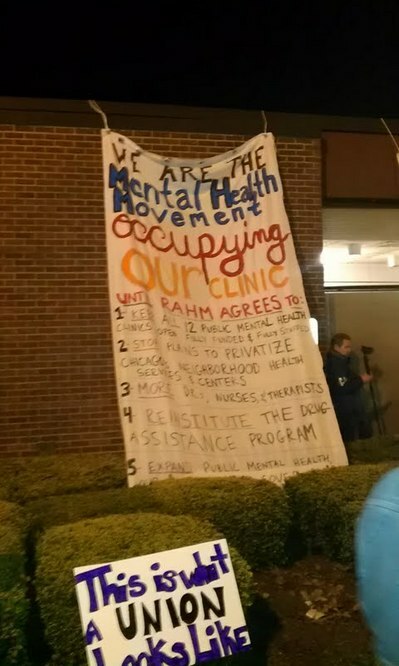 In order to cut the budget, Mayor Emanuel moved to consolidate twelve mental health clinics into six, and privatize the city's six public health clinics. The closure of the Woodlawn facility means consumers of these services will be forced to travel longer distances, into unfamiliar neighborhoods, and seek services from unfamiliar caregivers faced now with more burdensome loads.The uninsured may face serious gaps in care. Impassioned pleas to the Mayor to negotiate to mitigate anticipated consequences of this "cut" have gone unheeded for months. So health care consumers--not some "special interest," not a political interest group, but people with serious mental health conditions--have done the only thing left to them, as they face the closure of their clinic at the end of the month: occupy it to force the Mayor to negotiate. Despite assurances that there will be no change in quality care, the consumers of services have not been assuaged. One must assume that is not for no reason; that the closure of their clinic, the severing of their relationships with their care givers, will have some effect not accounted for. So they've thrust themselves physically into the bureaucratic machine to stop it and force those making decisions to deal on something of an even level with those who feel the consequences of decisions. To do this, they entered the facility late Thursday afternoon, and beginning at 4 p.m., used cement, impromptu fencing, chairs, vending machines, and chains to barricade themselves inside the clinic, where they are prepared to stay. 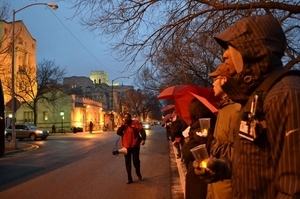 Meanwhile, outside, nurses, clergy, local residents, and other allies--as many as forty as of 10 p.m.--sat in front of the doors to protect their friends within. No less than fourteen Chicago Police Department vehicles, along with several County Sheriff's department cruisers, had blockaded the section of Woodlawn between 63rd and 64th Streets. After the news media left around 10:15, plainclothes cops in hoodies and jeans arrived. The atmosphere began to feel a bit more tense, as those assembled outside began speculating as to when the police would move in and try to remove the occupiers by force. A press event is planned for ten in the morning at the clinic. In the meantime, the Mayor has a decision to make about the politics of campaign commercials versus the politics of human need. On Tuesday, the Cook County Board of Commissioners will vote on the upcoming budget for the Cook County Health and Hospitals System (CCHHS). Tensions have arisen In the weeks since the CCHHS Board of Directors released their budget and the Cook County Board President Toni Preckwinkle informed the CCHHS Board of Directors that they could not request the required county subsidy because of what is set in the planned County Budget. As explained in a previous Gapers Block piece examining the Fantus Health Center, the CCHHS receives a county subsidy that helps with their funding. The rest of their funding comes from insurance, Medicaid, Medicare, and patients paying for their treatment. The current budget that will go before the board would ask for a $283 million subsidy; Preckwinkle has said that the maximum subsidy the CCHHS can receive is $248 million. This is Part Two of a series examining health care in Cook County. The Fantus Health Center provides a stark contrast to its neighbor, Stroger Hospital, making the latter seem almost a paragon of quality public healthcare with its modern design and efficient organization. The clinic, named after Dr. Bernard Fantus, who started the world's first blood bank at Cook County Hospital, is about 50 years old and shows signs of age from grime on the floors of the entryway. Immediately upon entering, you're greeted by a cacophony of conversations between people waiting to pick up their prescriptions and the numbers of people being served constantly being called out like a Department of Motor Vehicles station. Because of the size of the waiting area and possibly the dark walls and lighting, the waiting area for the pharmacy seemed to be more crowded than the ER waiting area at Stroger Hospital. "Fantus is probably what most people think our health system is like," Sonja Vogel, Communications and Marketing Director for Stroger Hospital and the Ambulatory and Community Health Network (ACHN), said while walking to the building. The outpatient clinic is noisy, dim, grim, busy and pharmacy area has a smell reminiscent of processed cheese in boxed macaroni and cheese. On the first floor, the pharmacy is the first thing that patients and visitors are greeted by, before turning down a hallway where The Lifestyles Center and Ambulatory Screening Clinic (ASC) are located. This is Part One of a series examining health care in Cook County. The lobby for John H. Stroger, Jr. Hospital of Cook County, is a clean, bright, modern space. On the left side of the lobby are a gift shop and coffee counter run by the auxiliary board, which uses the money to help buy furniture for the hospital and gifts for mothers that give birth in the hospital. In the center of the lobby is an information desk where a sign telling visitors to get in line sits at the front of a roped off area to contain the line. The windows near the elevators are large, allowing those waiting to see greenery around the Stroger campus as well as the older Fantus Health Center building while sun streams through the windows. What is the oddest thing about Stroger Hospital is that it does not seem to fit any conception of a public hospital most people hold. The state of Illinois has been increasing pressure on not-for-profit hospitals to justify the consider tax breaks they enjoy. Specifically, in order to qualify for the property tax exemptions enjoyed by not-for-profits under the state tax code, hospitals have to provide a certain amount of so-called "charity care," or care provided to low-income patients. If hospitals cannot show that they have provided sufficient charity care, the state can move to revoke their tax exemptions. For small community hospitals, losing such exemptions could be devastating, leading to closure or absorption by larger, for-profit chains (which could limit or eliminate certain services). The Illinois Department of Revenue moved last month to strip property tax exemptions from Prentice Women's Hospital, a sparkling new medical center in Chicago's tony Streeterville neighborhood; Edward Hospital, a rapidly expanding medical center in the western suburb of Naperville, and Decatur Memorial Hospital in central Illinois. In anticipation of new tax challenges, hospitals in Illinois are preparing a lobbying push that would seek to redefine the qualifications for tax exemptions. The new definition would go beyond just charity care and expand to include patients' unpaid debts, costs of medical care not covered by Medicare health insurance for the elderly, Medicaid coverage for the poor, as well as direct costs that teaching hospitals pay to train doctors and conduct research. It is a difficult policy area. Surely, since for-profit hospitals pay property taxes, not-for-profits should do something that differentiates them--they should, in a sense, compensate the public for their exclusion from property tax requirements. But these hospitals don't exist in a vacuum--they have built their business model and services around the assumption that they would be able to operate without paying the significant tax, and a sudden revocation could result in closure of these hospitals or elimination of non-profitable services (such as primary care, which is notoriously underfunded in health care, but critical to controlling long-term costs). If these hospitals are forced to close or are absorbed into larger systems which then cut non-profitable services, the community not only doesn't get any charity care, it doesn't get care of any kind. Hampering not-for-profits from hampering and watching for-profit chains move into those markets could be disastrous for those communities. Notably, the hospitals Japsen cites as being the most recent targets of the Department of Revenue are not in seriously under-resourced areas. On August 25, Saint Francis Hospital in Evanston was fined $23,800 by the Occupational Safety and Health Administration (OSHA) for employees being exposed to patient blood. According to Robert Malgieri, spokesman for HEART/AFSCME, the employees at St. Francis Hospital contacted OSHA due to their own concern for employee safety. The 13-page complaint issued by OSHA states that St. Francis has failed to inform housekeeping staff of tasks that would result in exposure to bloodborne pathogens, have materials for bloodborne pathogen training in an appropriate language for the employees, explain what would be the plan for St. Francis Hospital if an employee was exposed to bloodborne pathogens, failed to explain what tasks would result in possible exposure to bloodborne pathogens, did not tell staff of methods that could prevent exposure, and that employees were not given a session to ask questions during the bloodborne pathogens training session. Bloodborne pathogens include the Hepatitis B virus, Hepatitis C virus, and HIV as well as viral hemorrhagic fevers such as Ebola and Lassa fever. "The Last Thing They Should Cut"
The ad's message portends just how grievous the cuts to social services will be if the public attitude towards public spending--vilified by anti-public zealots for generations--aren't improved. More than 50,000 senior citizens in Illinois are cared for by home care workers, allowing them to stay out of (expensive) retirement homes and maintain some of the dignity of living in their own home. 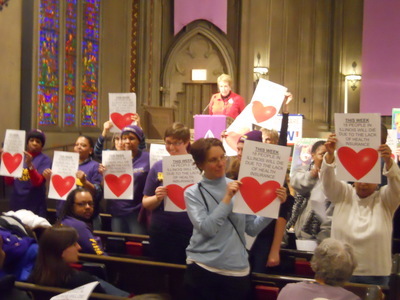 On March 9, the same day that activists rallied in Washington DC to demand health care reform by making 'citizens arrests' of insurance company CEO's, a forum at the University of Illinois in Chicago School of Medicine showed the debates in the Left about whether or not the bills being proposed and voted on by Congress are worth being called reform. Organized by the Chicago Single Payer Action Network, the featured speaker was Dr David Scheiner, who was President Obama's family doctor for 22 years. While it was not billed as a debate, opinions about the bill came out. The big issue seems to be whether or not the health care bills in Congress would be an incremental step towards a universal single payer system (medicare for all), or simply a bailout for insurance companies. Dr. Scheiner is one of the few doctors in the Chicago area who still does house visits and is a member of Physicians for a National Health Program. Scheiner simply stated, "I last saw [Obama] last 2 ½ years ago. Since that time, over a hundred thousand Americans have died due to lack of health insurance." Dr. Schiener was deeply critical of the right wing and the present health care system, "one of the things you hear Republicans saying, 'you don't want government between you and your patient.' Medicare has never interfered with me... you can't get around the insurance companies. They're sitting in my room, the insurance representative is there telling me what tests I can get, what doctors I can send them to, what prescriptions I can give." Sheila Rogers addresses a crowd of activists. 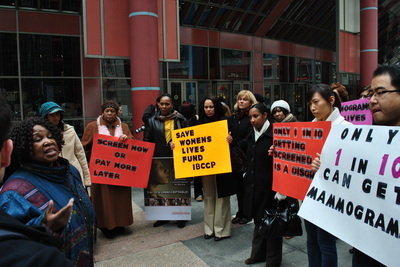 The Metropolitan Chicago Breast Cancer Task Force protested and demanded better funding for the Illinois Breast and Cervical Cancer Program on March 8, International Women's day. The IBCCP provides free screenings and treatment for breast and cervical cancer, however over 4500 women are on a wait list because of lack of funding for the program. While over 300,000 women are eligible for mammograms through the program, there is only funding for 33,000 women. The Metropolitan Chicago Breast Cancer Task Force attempts to end the racial disparities in health care and was applying pressure before the governor announces his budget. An extra $8 million for the IBCCP would eliminate the waiting lists. Another $31 million would double the number of women served by the program. While 20 activists rallied outside the Thompson Center shouting, "pay for screenings now or pay more later!" Shelia Rogers attempted to gain a meeting with Governor Quinn. Rogers was able to obtain the governor's scheduler's phone number and the group will continue to apply pressure. Breast Cancer surviver Dorothy Warren works for the support line of the Breast Cancer Network of Strength, "we have a database where we recommend women to get free mammograms because they cannot afford it. without this resource [the IBCCP] we would be lost." Warren said that the program "saves lives" and described it as a last line of defense for women. "Some women have lost their jobs, they can't afford it but they need screenings. This program is their only resource." Health Care Activists Rally Against Insurance Company "Death Panels"
On February 16, 2010, about 150 people attended a rally outside the Chicago offices of the death panel Aetna. While Aetna claims to be a health insurance company, the statistics tells a different and morbid tale. The rally was organized by Health Care for America Now!, a project of Citizen Action Illinois, to publicize their report "Health Insurers Break Profit Records as 2.7 Million Americans lose coverage." The report publicized that the combined profit of the top 5 health insurance companies was up 56% to $12.2 billion in 2009. The companies were able to make such a sickening profit by literally allowing their paying customers to become sick. They dumped paying customers who became a liability, and denied coverage to those who apply. This ended up growing the number of people on public assistance and those without any coverage. The report claims that "people without health insurance coverage are more likely to delay care, to get less care, and to die when they fall ill."
The report cites one study which claims that 52 million Americans will be without coverage in 2010. That is 1/6th of the United States, with no realistic way to afford health care. 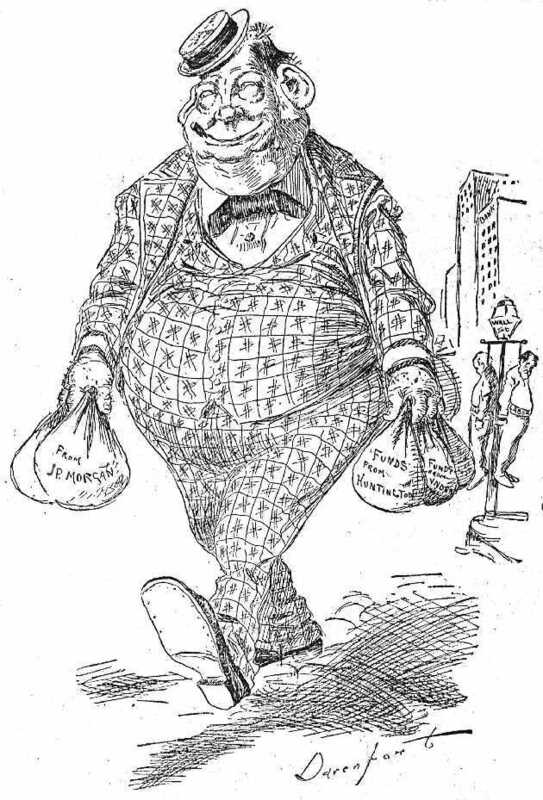 In the 19th Century, wealth was distributed by height. An examination of 2,314 personal bankruptcy cases found that medical expenses caused an estimated 62 percent of the bankruptcies filed nationwide in 2007, according to an August study published in the American Journal of Medicine. In the same year, more than 40,000 nonbusiness bankruptcy cases were filed in Illinois, according to the American Bankruptcy Institute. The study's result, compared with findings from a similar 2001 study, shows that the share of bankruptcies caused by illness and medical bills increased by almost 50 percent between 2001 and 2007. Of the medical bankruptcies studied in 2007, three quarters of the filers had health insurance when they became sick. "For most people, the issue is that they have insurance but it's nearly worthless," said Dr. David Himmelstein, associate professor of medicine at Harvard University and one of the study's authors. "You have this insurance card, but it still leaves you with bills." Consider this a shout out to my "personal responsibility" friends out there who think the working class is in so much credit trouble because they're buying Dodo egg-yolk fueled ski-doos and genital-massage equipped flatscreens. In retrospect, I should've continued my COBRA coverage. The political world is abuzz about Chicago's own Congressman Mark Kirk, who tried to get a "Death Panels"-style meme going but failed miserably. You can read the history here, here, or here. There isn't much more to say on the facts of this story. I do have some thoughts, though. One aspect of this that hasn't been focused on enough is that Kirk actually thought twisting the truth the way Palin does was worth the risk; he thought it was an effective political strategy. What Kirk didn't realize is that Sarah Palin gets attention more because what she says is unbelievable, outrageous and weak in the truth department than because she is arguably a politician was a politician. Palin is more entertainment than serious policy. Kirk is still regarded--comparatively--as a more serious politician with a better track record and a more promising future. (Let's be real here--Palin will never be president. Period.). Because of that difference, and the fact that Kirk is in a state that remains blue and hesitant to Republicans' accusatory statements about healthcare reform, he will receive more serious scrutiny and less attention, even proportionately, to Sarah Palin. Kirk outlined core elements of Republicans' health reform proposals in the address, arguing that the healthcare bill passed a week ago by the House would do little to reform the system, and result in higher taxes. What about reducing prices? What about insuring millions of Americans? What about stopping insurers from rejecting consumers based on preconditions? That's all nothing? Thursday Watch Party - Won't Someone Think of the Insurance Execs? Representative Alan Grayson (D) - FL said that Repubs "want you to die quickly if you get sick" and called government's inaction on health care a "Holocaust". Republicans, of course, want to slap him on the wrist for his comments, by using the same mechanism used on ol' boy Ragin' Joe' Wilson. Rep. Grayson is the same guy who introduced the Paid Vacation Act of 2009, which would catch America up to the Phillipines in mandatory time off per year (but still far behind every other industrialized nation on earth). Earlier this week, Roland Burris (D-IL) became the first member of the Senate to definitively say he'll vote against health care reform legislation unless it includes a public option. That's an important development, but, looking at the math in the Senate, it would be a really important development if Burris was saying he'd help filibuster the bill if it omitted a public option. So I asked for a bit of clarification from Burris' staff, and his spokesman Jim O'Connor said "the Senator was very serious in saying he will vote against any bill that doesn't include a public option." But, he added, "[h]is goal is not to be an obstructionist, but as his statement said, to build consensus among his colleagues for a public option." So it doesn't seem likely that he'd block a health care bill from coming to the floor for a vote over this issue. But he could still pave the way for other liberal senators to take a similarly strong stance. We'll keep an eye out for that. From Burris's statements it sounds like he's interested in doing whatever it takes to have a public option included healthcare bill. Let's hope that's the case. So I was at the post office the other day, mailing something to my special lady friend. It's long distance so you really have to send letters and what not to keep points on the scoreboard, so to speak. I had tried FedEx and UPS, but their prices were astronomical - $60 bucks versus $10 - $20 for USPS. There I was, putting some stuff in a box and filling out all the appropriate forms, when some girl came in to ship something. It was only the two of us there at the Post Office, so I could easily hear her conversation with the USPS employee. The girl was trying to pay for her purchase with a credit card that said "See I.D." where the signature bar is on the back. The USPS employee was not down with that. You see, their policy is that you have to sign your cards. "You can sign your card right now, but we won't take it if it's not signed," the employee told the young lady - the damsel in distress, you might say. "I work at a bank," the girl protested. "We tell all of our customers to write 'See I.D' on the back of their cards because it's more secure. Your I.D. has your signature and your picture on it. It helps protect against theft." Former Congressman Dan Rostenkowski (once the chairman of the US House's Ways & Means Committee) back in 1989 was chased down by some senior citizens protesting legislation, Medicare Catastrophic Coverage Act. They complained that they had to pay more taxes for the additional benefits. Rostenkowski seemed more rattled by the citizens than some of the Senators facing their own angry mobs in the current health care debate. If only we had those types of contentious townhalls here. I can't argue about the people putting their politicians to the fire!